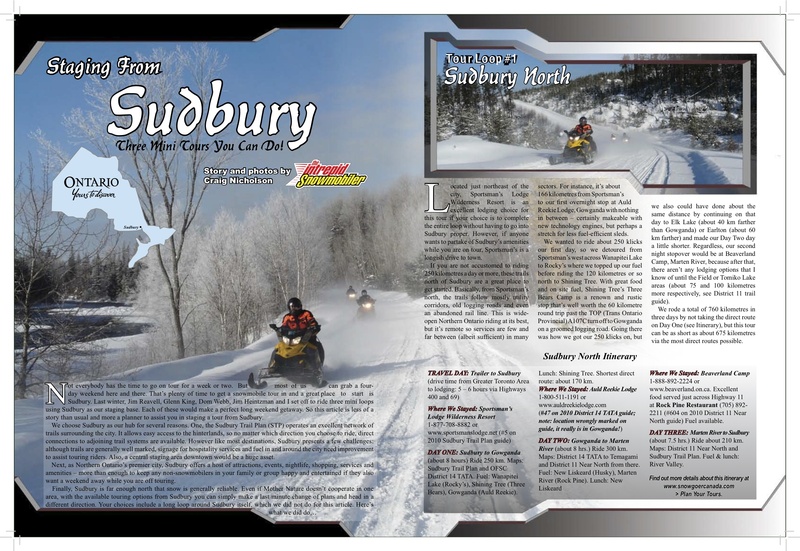 Snowmobile Sudbury Ontario with these great planning tools for your Ontario snowmobile tour or snowmobile vacation. Not everybody has the time to go snowmobiling in Ontario for a week or two. But most of us can grab a four-day weekend here with our snow machines on Ontario snowmobile trails when snow conditions are right. That’s plenty of time to get an Ontario snowmobile tour in. A great place to start is Sudbury in Northeastern Ontario. Last winter, Jim Reavell, Glenn King, Dom Webb, Jim Heintzman and I set off to ride three mini loops using Sudbury as our staging base. These make a perfect long weekend getaway. So this Ontario snowmobile tour article is less of a story than usual. It’s more a ride planner to assist you in staging to snowmobile Sudbury Ontario. Meanwhile, if you’re interested in other Ontario snowmobile tour destinations, check out the rest of my Ontario ride articles. We choose Sudbury as our hub for several reasons. One, the Sudbury Trail Plan (STP) operates an excellent network of trails surrounding the city. It allows easy access to the hinterlands. No matter which direction you choose to ride, direct connections to adjoining OFSC snowmobile trails are available. What’s more, Sudbury is the staging point for snow tours like the Cartier Moose, Chiniguchi Wolf and Rainbow Elk Loops. Starting in 2018, STP has divided the original Rainbow Elk Loop into two adjacent Ontario snow tours. The Rainbow Elk Loop is southwest of Sudbury. The new Deer Loop is located west of town near Espanola. However, like most destinations, snowmobile Sudbury Ontario presents a few challenges. Although trails are generally well marked, signage for hospitality services and fuel in and around the city need improvement to assist touring snowmobilers. Also, a central staging area downtown would be a huge asset. Before riding within Greater Sudbury city limits, be sure to check out the snowmobile bylaw defining where sleds can and can’t go. Next, as Northern Ontario’s premier city, Sudbury offers a host of attractions, events, nightlife, shopping, services and amenities. These are more than enough to keep any non-snowmobilers in your family or group happy and entertained if they want to do something else while you’re off touring. Read more about my Sudbury sledding, including full Ontario snowmobile tour itinerary and contacts!